BUSTERis a 58 Hatteras LRC in exceptional condition and offers a significant number of updates and upgrades over the past 24 months. The entire vessel from the water line up to the flybridge was just completely Awl-gripped in 2015. In addition, the pilot house has been modernized and the engine room and all of its mechanicals have been gone through, improved, repainted and detailed professionally. In recent years, galley equipment and counter tops have been redone, new carpeting installed throughout the vessel and a bow thruster added. This Hatteras LRC is in turn key condition and ready to take you cruising. "Buster" has been relocated to Daytona Beach, Florida. Owners change of plans makes this rare Detriot Diesel 6-71 engine option vessel available.Recent price reduction! Owners are looking for serious buyers! United Yacht Sales New Jersey would love to guide you through a personal showing of this 58' Hatteras 58 Long Range Cruiser Lrc 1976. 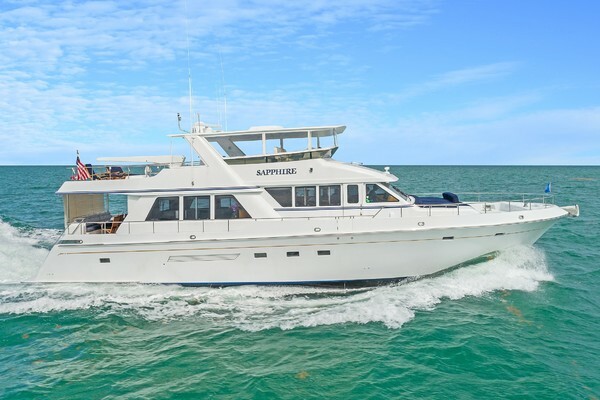 This yacht for sale is located in Key West , Florida and priced at $389,000. For a showing please contact us by filling out the form on this page and we will get back to you shortly! BUSTERis a three stateroom LRC with each located on the lower level. The master stateroom is aft with ensuite head and shower. The guest stateroom also with en-suite head and shower is located forward and to port and is accessed by a second stairway located in the pilothouse. The final stateroom is located all the way forward in the v-berth area and has accommodations for sleeping three. This stateroom also includes a complete head with shower. The fourth head is designated a Day Head and is on the upper main area across from the galley. The salon area includes a large L- shaped sofa to starboard and a chest of drawers with shelving above. An entertainment cabinet and stairwell to the master stateroom is opposite the sofa. Forward of the stairwell and cabinet on the port side is a built in desk and lounge chair matching the sofa. Wall to wall carpeting and custom wood blinds. The galley is located forward of the salon on the port side. On the starboard side is a pantry and the Day Head. A step up from the galley into the pilot house presents a completely upgraded and modernized wheelhouse. There is a large countertop for chart work, ample storage drawers, bench seat aft, and side deck access doors on both sides. The sole is varnished teak. Access to the flybridge is gained by a set of interior steps. The Day Head is just two steps away. The large flybridge has a full control console forward with a custom bench seat at the helm, a tinted venturi windscreen and bimini top. Behind that is the mast, which is hinged and may be let down for height restricted travel. Aft of the mast are two bench seats port and starboard. There are two cranes for lifting; one on each side with a dingy cradle in between. The full width master stateroom located aft offers a centerline king berth, cedar lined walk in closet to port and large cedar lined double door closet to starboard. There are built in storage dressers on each side of the bed. The ensuite head has new countertops, as well as, a large shower with seat. Entire area is carpeted. The guest stateroom has side by side twin berths with storage underneath, chest of drawers in the middle, hanging cedar lined locker, a wall lined bookshelf, and wall to wall carpet. The ensuite head has an updated countertop, tile floor, and shower. The forward most stateroom has a large v-berth with ample storage beneath. On the starboard side there is an additional berth above and sleeps 3. There are two port lights and a large overhead hatch for ventilation. There is a full size closet to port and an ensuite head with shower. Walking forward to the bow through the Portuguese Bridge there is an extended pulpit, anchor and windlass. Stainless steel stanchions with a varnished teak handrail and stainless steel lifelines surround the entire bow. In the center is a raised hatch with a station underneath which includes a fresh water wash down faucet, shore power and dock water hook-up. There are side decks on both sides of the cabin for complete walk around and ease of docking. The cockpit has two large hatches with access to the lazarette. The transom door exits onto a teak swim platform. The aft deck is completely enclosed with sliding glass windows port and starboard and new tinted plexiglass enclosure aft. There are wing doors leading to the side decks port and starboard. There is a wet bar with ice maker and a very large L-shaped settee with hi/lo teak table. The area is carpeted. This highly regarded model 58’ Hatteras Long Range Cruiser is in exceptional condition. From the “Pristine” engine room to the gleaming exterior Awlgrip paint.Buster is a must see for any potential LRC client &only one ofa fewcurrently available on the US East Coast. Vessel Shown By Appointment.